Karan (left) and Eric Clark of Oxford, present a check to Sandra Guest, vice president of the UM Foundation. 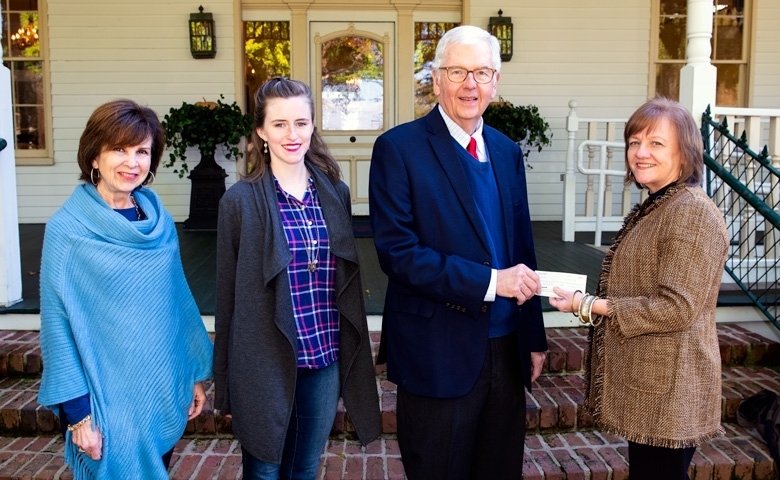 The gift adds a $10,000 contribution to the existing John S. and Mamie Craft Clark Memorial Scholarship Endowment Fund at the University of Mississippi. Joining them is the 2018 Clark Scholar, Margaret Jordan, a freshman mathematics major from Pearl. Eric and Karan Clark of Oxford, Mississippi, recently made a $10,000 contribution to the John S. and Mamie Craft Clark Memorial Scholarship Endowment Fund at the University of Mississippi. Clark and his brothers, John B. Clark of Ridgeland, Mississippi, and the late Larry E. Clark of Brandon, Mississippi, all UM graduates, created the scholarship in the 1980s to honor their parents: the late John S. and Mamie Craft Clark of Taylorsville, Mississippi—both devoted, lifelong Rebel fans. John S. Clark, who attended UM in the last 1920s and early 1930s, became a state representative from Smith County and a successful businessman, working in insurance, land and timber, and oil and gas. Mamie Clark was a respected community leader who was instrumental in the establishment of the Taylorsville library and museum. The Clark Scholarship was established so that the principal of the fund will always remain intact and the earnings are used to fund academic scholarships. Recipients are chosen based on scholastic achievement, leadership ability and financial need. To make gifts to the university, visit give.olemiss.edu for academics, www.umc.edu/givenow/ for the UM Medical Center, or givetoathletics.com/forward-together/ for Ole Miss Athletics.